What is this no spill pet feeder? This no spill pet feeder is perfect for any home with pets. 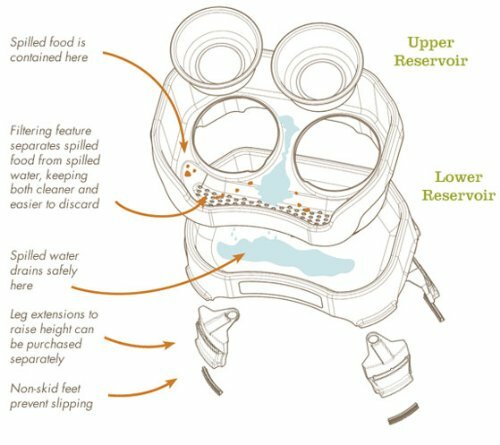 The revolutionary design catches spilled food at the top and collects spilled water at the bottom. It’s spill-proof, mess-proof and even kick-proof so you no longer need to clean up excessively after each meal-time. Most other feeders are low to the ground. This can place stress on the joints and is not good for digestion for your dog or cat. The no spill pet feeder is much healthier for your pet as it is elevated for a much more enjoyable meal-time. Comes in various sizes for smaller and bigger dogs. The feeder that is lower to the ground is designed for small dogs and puppies up to 9″ at the shoulder and up to 18 lbs in weight. The larger pet feeder is designed for dogs who are 30 to 100-pounds. It’s 100% dishwasher safe, comes with two stainless steel bowls as well as basins, durable for indoor or outdoor use and easy to clean. Although owning a pet has so many wonderful moments, the clean-up after your pet is not pleasant. Just like kids, pets tend to be very messy. Feeding time can be difficult as pets do not care if your floor stays clean or not. Many pet food bowls are left on the floor and thus often knocked over while walking. 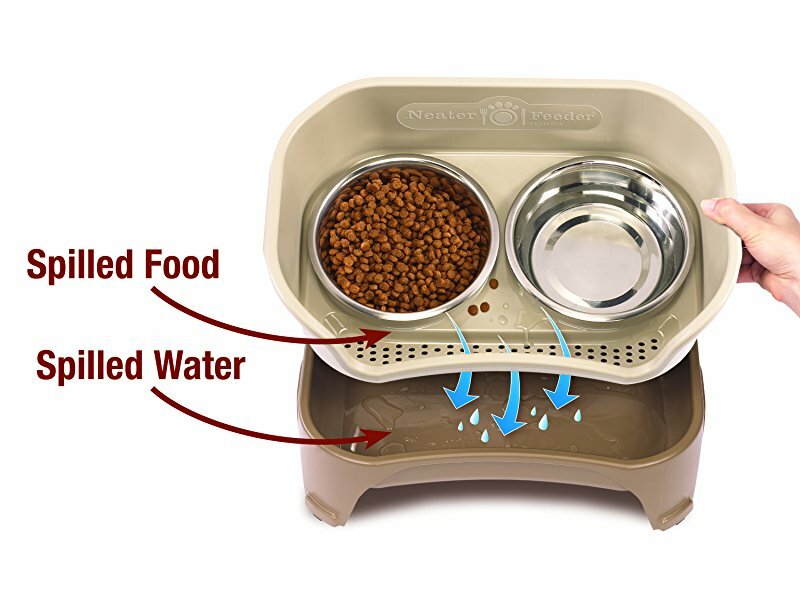 Having a no spilling pet feeder that is sturdy and will not spill food makes a lot of sense. The upper tray catches the solids and the lower tray gathers the water. Whether you have a dog or cat, this feeder is perfect for big and small animals. The feeder is elevated to help with better digestion to prevent joint problems. And not having to bend the neck to reach the food on the floor will definitely make meal time more enjoyable for your pet.